When I first decided to leave WUMD to begin writing for the Michigan Journal during my senior year, I really wasn’t sure what to expect. Though I had been broadcasting sports since high school, I have never really done any written journalism. I was concerned that I would not be as good as I am in front of a camera or microphone. I quickly learned from my good friend and Sports Editor, Ricky Lindsay, that I had some talent with writing as well as broadcasting. I really enjoyed being able to follow the University of Michigan-Dearborn Wolverines hockey team, especially in a season that brought so much change for them. The experience gained through writing articles for the sports section was invaluable and definitely something I would have regretted if I never did it. The next few months are going to be hectic. I have been in the classroom for 19 years now, starting with kindergarten in 1995. Now I am at that point in my life where the classes are over and the real work begins. Despite the fact that I have spent the last year writing and did not do any broadcasting, I plan on returning to television and radio. Where that might be is still up in the air, though. 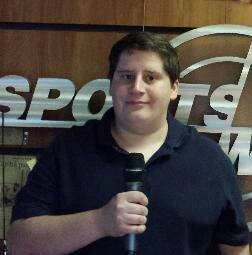 This past summer term and this winter term, I’ve interned with FOX 2 Detroit’s sports department. My ideal workplace would be with those people, but unfortunately their options are limited for a new college graduate. I am currently seeking opportunities at FOX 2 and elsewhere in the state of Michigan, be it in Detroit, Flint, Traverse City, Cadillac or Grand Rapids. Hopefully I will be able to stay in this state, but if I find a good job outside Michigan then I would have no choice but to leave. I would like to wish everybody at the Michigan Journal and in the UM-Dearborn athletics department the best of luck. I will try to keep up with what is going on at UM-Dearborn and in our sports department as much as I can. Lastly if anyone reading this is thinking about a career in journalism or broadcasting, I highly recommend writing for the Michigan Journal as well as doing one or two internships. Although some may see the Michigan Journal as just a club or something to do after class, these people really put their heart and soul into each issue. The writing you do now for the Michigan Journal would greatly help you in the future. Thank you all for reading and thanks to the Michigan Journal for giving me this great opportunity, but now it is on to the next adventure in my life.